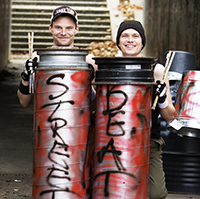 The original Street Beat percussion assembly, presented by a duo drum team. Students will learn what percussion REALLY means and discover the basics of combining and orchestrating low and high pitch to produce more interesting sounds and music. Students will discover the importance of practicing and will even get a couple immediately applicable exercises to take home. A fun, very informative eye opener to the world of Re-Purposed Percussion. Ready to bring the main components of a world class performing arts show to your school? Boom Tap will do just that! This assembly offers schools an opportunity for students to see the main pieces of Street Beat’s theatrical performing arts show. The presentation is delivered by 2 drummers and 1 or 2 break dancers that give an insight to what tools there need to be in place when drumming and dance successfully must work together in a show. Packed with student interaction, this show is great for students that have already seen “Re-Purposed Percussion”. Percussion and Boom Tap continue to remain important for students to learn about, our newest show Hip Hop Pizzazz will apply those drumming and dance concepts directly on to today's most festive radio dance hits within the realm of hip hop and electronic pop music. 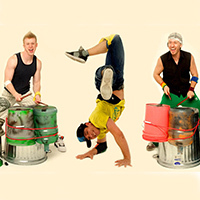 Along with Repurposed Percussion and Boom Tap, Hip Hop Pizzazz completes the Street Beat school show trilogy! Street Beat’s Family Fun Nights GUARANTEE to create great times and lots of laughter. With the Drum Off and S.B. Jam, this presentation takes audience interaction to a whole other level. Street Beat will turn your family fun night into the FAMILY FUN NIGHT of the year! For more info, please call (310) 403-7884 or email info@streetbeat.biz.